April 7, 2019 admin Comments Off on Service Opportunity! Are you looking for an opportunity to sponsor, volunteer at events, speak or provide other service to our intergroup? WE WANT TO HEAR FROM YOU! The Speaker Sign-up List has gone digital – and it's expanding! When you fill out the simple form below, you will have your finger on the pulse of service opportunities in our intergroup. But the only way to get involved is to click on the link below! 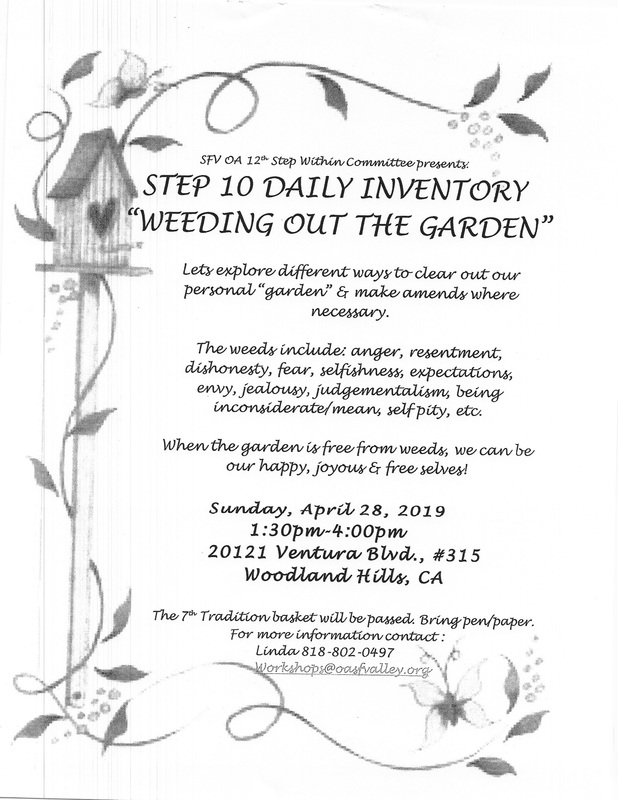 Join us for an afternoon where we’ll explore various methods to tend to our personal “garden” and weed out things like anger, expectations, and self pity. To see upcoming events from other OA intergroups, click here. GIFT CERTIFICATES ARE NOW AVAILABLE FOR PURCHASE. Looking for a gift idea for an OA fellow? Give the gift of OA in any denomination. We are excited to offer Gift Certificates, redeemable at the OA office for literature. Simply click the button below and complete the checkout process via PayPal. PayPal will email a printable gift certificate to your recipient, or you may opt to print the certificate out yourself and present it to them. The Gift Certificates are redeemable at the OA Office. Simply bring in your printed or digital certificate. Overeaters Anonymous offers a program of recovery from compulsive eating using the Twelve Steps and Twelve Traditions of OA. Worldwide meetings and other tools provide a fellowship of experience, strength and hope where members respect one another’s anonymity. OA charges no dues or fees; it is self-supporting through member contributions. OA is not just about weight loss, gain or maintenance; or obesity or diets. It addresses physical, emotional and spiritual well-being. It is not a religious organization and does not promote any particular diet. If you want to stop your compulsive overeating, welcome to Overeaters Anonymous. The weekly schedule of meetings throughout the San Fernando Valley has been updated. 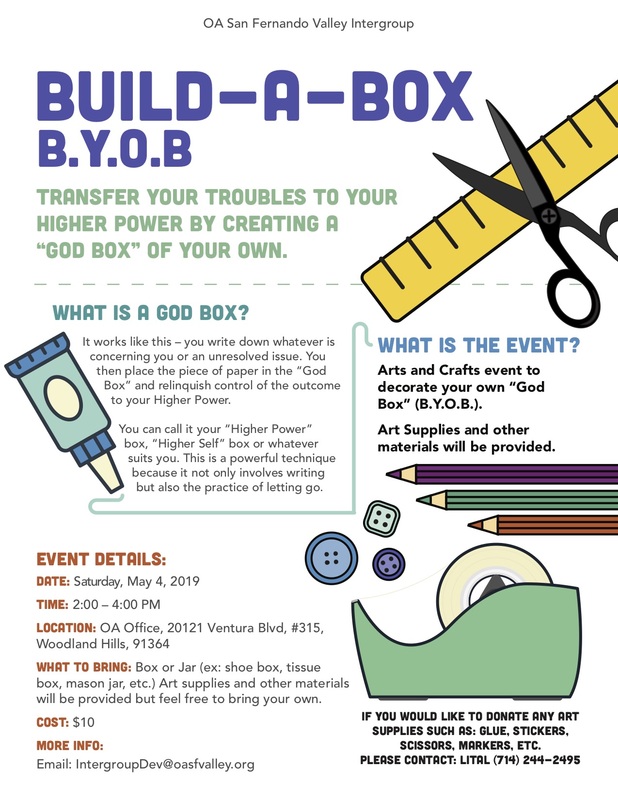 Download the Public Outreach Flyer which includes a deposit slip to help support reaching out to the professional community. OA Literature can be orderd by phone, fax or email!! Delegate meetings are held the 3rd Monday of each month, 7:30 pm., in the OA Office. So that we can provide an accurate Meeting Directory, please confirm the contact information for your meeting is current. Updates should be sent to the 5th Tradition Editor and Literature and Digital Resources Chair. A Delegates Meeting is a meeting chaired by the OASFV Intergroup Board for the benefit of delegates elected by the meetings within our intergroup. The Board members update the delegates as to the past, present, and future status of our intergroup. The meetings are held every third Monday of the month from 7:30 p.m. – 8:30 p.m. Members and Guests are welcome to attend and observe. An OASFV Board Meeting is an administrative meeting for the members of the OA San Fernando Valley Intergroup Board. These meetings are held at the office every first Monday of the month from 7:30 pm to 8:30 pm. Members are welcome to attend and observe. If you would like to support the San Fernando Valley Intergroup, please feel free to send us a donation via PayPal. You will automatically be billed once a month until you decide to cancel your subscription. If you have any quesitons feel free to email our webmaster. GIVE THE GIFT OF OA! We are excited to offer Gift Certificates, redeemable at the OA office for literature. Simply click the button below and complete the checkout process via PayPal. PayPal will email a printable gift certificate to your recipient, or you may opt to print the certificate out yourself and present it to them. The Gift Certificates are redeemable at the OA Office. Simply bring in your printed or digital certificate. Please call prior to coming to the office to make sure the office is open.